The XF is the latest confirmation that Tata was absolutely right. Jaguar never forgot how to build contemporary executive saloons, it just wasn’t allowed to. 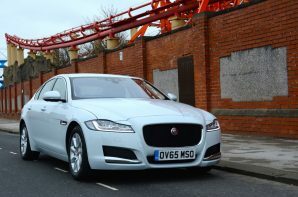 The XF takes the fight to the BMW 5 Series, Audi A6, and Mercedes E-Class head on and is all the better for it. Jaguar has invested heavily in integrating aluminium into its production models with fantastic results. The latest XF is significantly lighter than the competition and is just 4% heavier than the smaller XE. Such a radical weight loss diet gets a big thumbs up from us as it benefits fuel consumption, handling and performance. Alongside the advanced construction materials the XF also boast a brand new ‘Ingenium’ engine which finally provides Jaguar with a world class diesel engine. It also contributes to the weight loss thanks to yet more aluminium and its compact size. At the same time it is capable of producing impressive power and torque figures which imbue the Jag with sprightly performance. There has never been much wrong with the way that the XF drives or looks, but it has never had a really efficient engine. With this issue now firmly addressed the combination of excellent official fuel economy, engaging dynamics, impressively low kerb weight and svelte looks make for a compelling proposition.